New proof of concept could guard against the disorienting effects of laser pointers invading the cockpit. (Inside Science) -- The FAA received more than 6,700 reports of lasers striking aircraft in 2017, a dramatic increase from just a decade earlier. 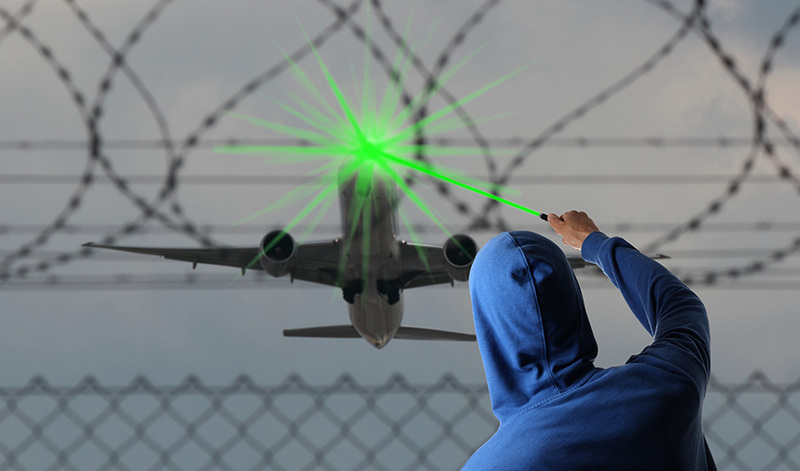 Commercially available lasers can disrupt a pilot's vision and endanger those aboard the aircraft, especially during the critical phases of takeoff and landing. Now, researchers have developed a glass embedded with liquid crystals that could shield a plane's cockpit from these disruptive attacks. The typical laser pointer used for presentations is red, but our eyes are especially sensitive to the green laser light that makes up the majority of reported incidents. To protect against both red and green, and the multitude of other colors of lasers that are available to the public, Jason Keleher and Daniel Maurer of Lewis University in Romeoville, Illinois, developed a flexible solution able to block many wavelengths of light. Could Nobel-Winning Laser Tech Make Sci-Fi 'Tractor Beams' a Reality? The pair announced their proof of concept this week during a meeting of the American Chemical Society in Orlando. The technique relies on a thin layer of liquid crystal sandwiched between two pieces of glass on the windshield. They divided the demo model into four sections. In each, the crystals are usually aligned, which allows light to pass through. But when laser light is detected, the system applies a voltage to the affected section of glass, which quickly frosts over and blocks much of the incoming light, helping pilots avoid injury and temporary vision issues. Dividing a windshield into sections would keep most of it clear for normal operations, even when the system detects a laser. "You don't want the whole windshield to go frosted -- you want only the spot on the windshield that is being hit by the beam to go frosted," Keleher said during a press conference. The pair is continuing their research by investigating a collection of liquid crystals to find the one that's best able to keep pilots and planes safe -- and unwanted laser light out of the cockpit. Chris Gorski is an Editor for Inside Science and runs the Sports beat. Follow him on twitter at @c_gorski.